After a lot of hard work, we’re happy to announce that our new Palermo Buenos Aires apartment rental is finished and ready to rent! The Fitz Roy Suite is a modern 50 square meter, open one bedroom Buenos Aires rental apartment located on the best block in Palermo Hollywood, Fitz Roy between Guatemala and Soler. This block and surrounding neighborhood are home to some of the best restaurants in Buenos Aires: Osaka, Sudestada, Bio, Francisco, Romario, Miranda, Soberbia 22, and many more. 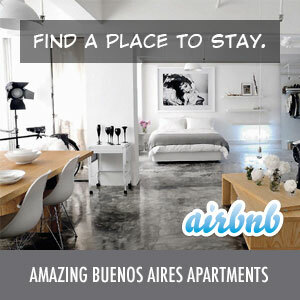 You’re also walking distance to bars, shops, the subway, Palermo Soho and much more. The building also has a great pool and parilla (BBQ) on the roof. There is also a washing machine and dryer available in the building. The rates vary based on the season. Please contact us for a quote. We accept cash, credit card and Bitcoin. There is a $10/night charge for more than two people. Maid service is available for $40/cleaning. Check in is at 4pm and check out is at 10am though early check-in or late check out can be arranged for $45 each provided there are no overlapping guests on the same day. Our standard check in and check out time is from 8am – 9pm. Any check ins or check outs outside of these hours have a $45 off-hours charge. We offer significant discounts for longer stays and can accept payment in cash or credit card. If you book with us, we’ll meet you at the apartment to check you in, give you an overview of the apartment and neighborhood, and answer any questions you may have. In addition, since we live nearby, we’re always available to help with any problems and can even store your luggage if you’re planning to do additional traveling. If you’re looking for something a bit smaller, you can check out our other Buenos Aires apartment rental. Please contact us if you’re interested in booking or just have questions about the apartment or BA in general.